Aging does not automatically make driving an unsafe practice. However, driving can become dangerous when health conditions begin to impair senses and functions needed for driving. The following tips may help family members and caregivers ensure the safety of elders and others on the road. Seniors should have their vision tested at least once every two years. If issues are found, these should be addressed and corrective action should be taken before seniors get behind the wheel again. Some vision problems may be correctable with glasses or contact lenses, while other may require surgery. While waiting for these treatments or corrections, seniors should seek assistance with transportation. If serious conditions impair vision to a point that makes driving unsafe, the issue should be addressed in a firm but compassionate manner. Age and health conditions commonly affect the ability to hear. Seniors should have their hearing checked approximately once every three years or more often if a problem is suspected. To make it easier to hear and avoid distractions, seniors may also wish to limit the amount of noise in the car when driving. Many medications impair driving abilities. If seniors are required to regularly take medications that have drowsiness, dizziness, or other impairments as side effects, driving may be unsafe. If the medication is temporary, seniors should request assistance with transportation for the duration of the treatment. If medications are required for conditions of a more permanent nature, caregivers or family members may wish to discuss the issue with the elder and the doctor to determine whether alternative solutions can be found that will not affect driving abilities. Seniors may be embarrassed to ask for help with transportation, even when they are not entirely comfortable behind the wheel. Caregivers and family members can help to bring these feelings to light by having a discussion with seniors about their comfort with driving. In some cases, it may be helpful in identifying issues that do not require a complete loss of the ability to drive, such as discomfort with driving at night or an inability to see around the car due to the placement of mirrors. Uncovering these types of issues helps caregivers to find resolutions that can improve safety and comfort for seniors. There are driving refresher courses that are geared specifically toward senior drivers. 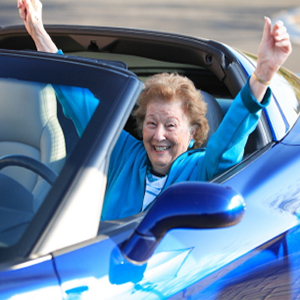 Participating in these courses may give seniors a renewed sense of confidence behind the wheel. Taking part in a driving refresher course also allows seniors to ask questions that they may not be comfortable asking family members. Prolonging the ability to drive can help seniors stay and feel independent longer, which can be beneficial for self-assurance and overall emotional well being.